The most recent Australian employment figures, which were released by the Australian Bureau of Statistics (ABS) before the open of the London session yesterday, as Oz is in a different time zone, showed an extraordinary rise in employment. This went completely against the tendency Down Under, which is for a softening economy and all that goes with it. No sooner were the figures released than commentators, particularly in Australia itself, began to doubt their reliability. In an article in Business Spectator, the well-respected Callum Pickering, (Making sense of the surprising jobs spike) was one of the foremost. “As for the Reserve Bank of Australia, it is firmly in wait-and-see mode. They won’t have to make any major decisions using this data. After the initial confusion and a few frustrated calls to the ABS [Australian Bureau of Statistics], I expect that the RBA will simply write this month off and hope that the data returns to normal soon”. As the announcement was taken at face value by market participants initially, there was a sudden reversal in the downward trend of the Aussie currency pair (AUDUSD). As can be seen in the chart above, this provided our Mandelbrot algorithmic routine with the opportunity it had been waiting for, to get in on the short side. Later in the trading day, when the reality of the dodgy figures dawned, the pair resumed its journey to the downside. 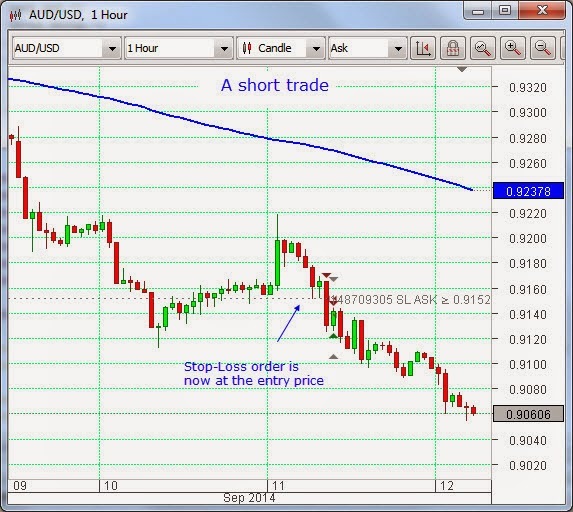 We have been convinced of Aussie weakness for a little while. However, it is not good market discipline to chase a move in any instrument, so one must wait for either a dip or a pull-back in order to get in, while keeping probability on one’s side. Mandelbrot has, in accordance with its instructions, already locked in profit on half the position and moved the stop-loss to Break-Even.